100% Cancellation fees. We are flexible on reductions in numbers depending on the type of pitch booked. We accept performance groups as well. Edinburgh Festival Camping, the only dedicated campsite for the Edinburgh festivals, is due to open again on 2nd August 2018. 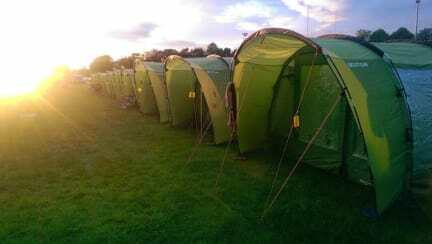 Run by Campingninja, specialists in temporary campsite, Edinburgh Festival Camping offers wonderful community atmosphere, quality tented accommodation and great on-site facilities. Open to visitors and performers, Edinburgh Festival Camping offers an affordable, accessible & convenient family friendly accommodation. 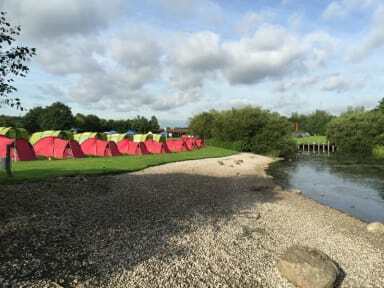 We host Basic Grass Pitches for 'Bring Your Own Tent camping', as well as Meadow Pitches for Campervans, Motorhomes and Caravans, Pre-Pitched Tents for up to 4 persons and furnished Bell Tents for up to 6 persons for that extra bit of comfort. Sleeping packs can be purchased for complete easy camping. Our 2 Person Tents are good quality Eurohike Avon tents, designed for 3 guests but used to sleep 2 people in comfort, available in Twin and Double configurations. These tents offer a separate sleeping area and porch area. Our 4 Person Tents are a great family option, with a 2 by 2 sleeping configuration with zipped separation. There's a large living area and integral canopy area to offer protection from the elements, 2x double air mattresses included. Standard on-site facilities include excellent showers (we get great feedback about them! ), toilets, licensed bar, cafe and official Fringe Venue in our Giant Tipis, device charging points, hairdryer booth, and much more! Our Official Fringe Venue offers entertainment provided by both resident and non-resident performers, with magic, comedy, music and more. This property requires full pre-payment. We will get in touch once the initial deposit has been made to collect this. Check in from 14:00, late check in available. Wrist bands will be provided and secured to your wrist. These are not transferable. No entry without a valid wristband for an area will be permitted. Campers arriving after 12am will need to check in with security and so may not be given full facility information. Late arrivals are asked to please pitch tents with respect and consideration to other campers. Assistance will not be available. Torches will be required. No entry to the site will be permitted prior to the initial check in time unless previously arranged. You are requested to respect your neighbours whilst camping with us. Anti social behaviour will not be tolerated, in the event of antisocial behaviour you will be removed from site without refund. We have a quiet policy after 11pm which you are requested to take note of. To keep yourself and all campers safe, No Open Fires, Disposable BBQ’s or Fireworks are permitted on site. Please ensure your party all know where the fire point is. Please respect the fire safety rules. In the event of needing emergency medical assistance, or any help at any time please contact any steward, or security staff who are able to radio colleagues for assistance. Campers are requested to leave the site by the check out time given. Abusive behaviour or shouting at other guests or staff members will not be tolerated.